– For Normal To Dry Hair Enriched With Certified Organic Botanicals No Animal By-Products Cruelty Free Protects Chemically Enhanced Hair Color Adds Moisture And Manageability Infuses Shine Every Day, All Day Contains No Laurel/Laureth Sulfates When Hair Is Dry, It Needs A Drink. 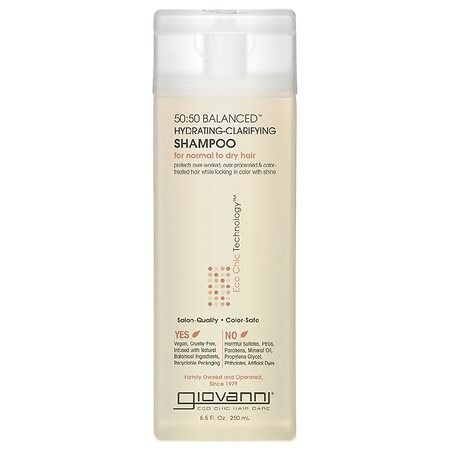 – 50/50 Balanced Shampoo Balances The Art Of Clean With Supreme Protection. – Give It The Hydration It Needs, And Wants, With A Balance Of Ingredients That Infuse Moisture While Locking In Color. – Gentle Enough For Every Day, Superior Shine Is On The Way. – Giovannicosmetics.Com Real Organic Hair Care. – Guaranteed When Purchased At Quality Beauty Retailers.